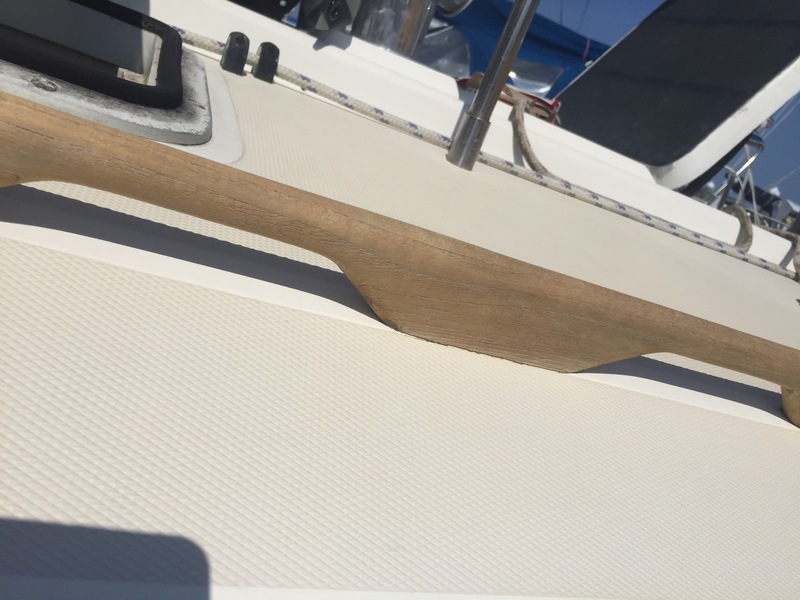 One of the things I really like about Sabre is their use of teak, enough to look yachty, but not so much that it’s a pain to take care of. My Sabre only has teak towrails, handrails, and the teak stripes just in front of the cockpit which acts as a trademark. The teak sat neglected for years, but had been well varnished prior, some parts of the old varnish hung on for the 3 or 4 years (or longer, not sure when it was varnished last), which was impressive. Obviously I can’t own a Sabre and leave it looking like this. I cruised around the net looking at my options, and was close to settling on the tried and true Cetol method. 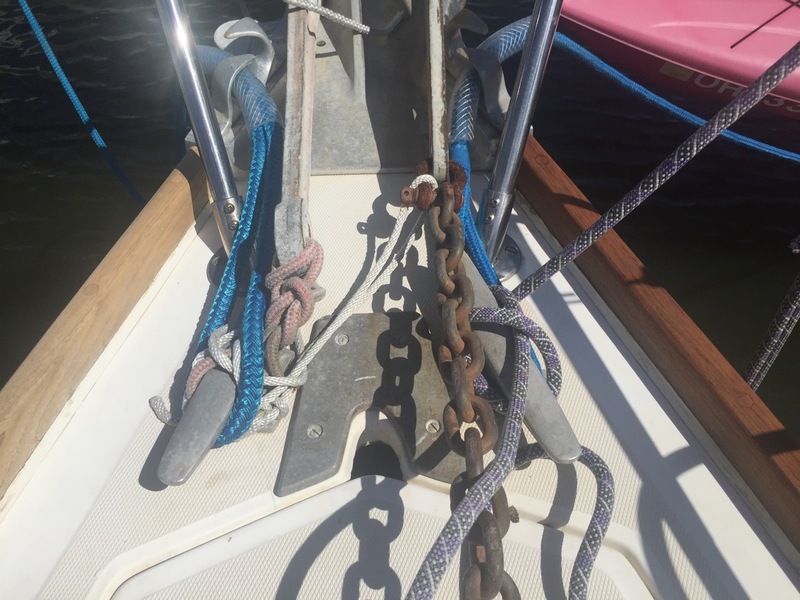 I’ve used that on my other boat, and it works well, but I’m not stoked about the process. Then someone turned me onto Semco. Rather than a varnish, or an oil, it’s a sealer with a stain in it. 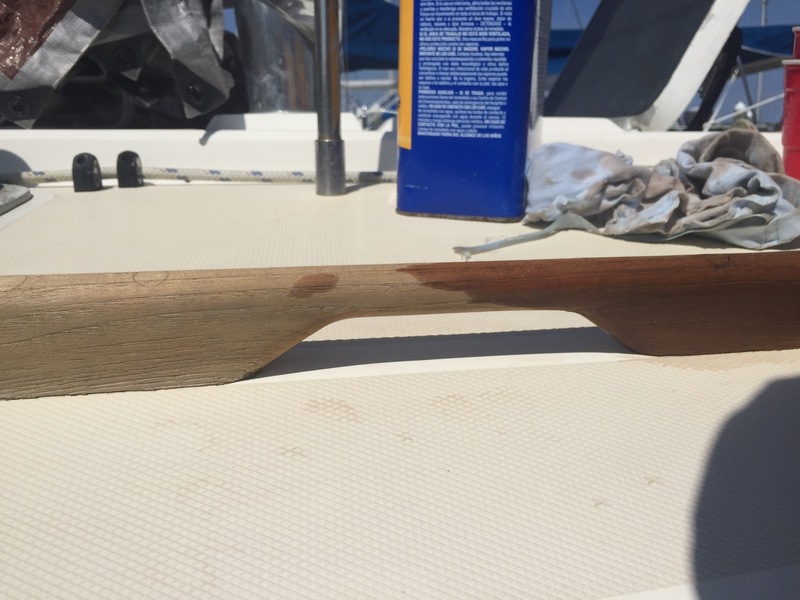 It comes in various shades, my buddy had one of the lighter shades on his boat, and it looked like the teak was just installed. It’s not glossy, but just looks like raw teak. The process is amazingly simple, and doesn’t take long when compared to varnish. So I heatgunned, sanded and sweated the old varnish off to get to a relatively clean bare wood. Then I used their two part teak cleaner. 1st part is an acid that turns the wood really dark, like scary you-just-messed-up dark. Then you rinse it really well, and apply part two which magically turns the wood back to a light teak color. It’s fun… unless you don’t use gloves like I did and your hand starts to burn a little. Use gloves. Let the wood dry for a day, then start applying the sealer. It’s really like a stain, very watery, and the color separates quickly. I used a solo cup to keep my volume low so I didn’t need to keep mixing the whole can of sealer every brush stroke. I also just used a small sponge to apply it. Keep rags handy, and some acetone or alcohol to wipe up spills and drips. The acid washing of the teak will remove the wax you had on the fiberglass, so I actually applied a quick coat of wax between the cleaning and sealing part. I also did another sand with 220 to knock down the grain that gets raised by the cleaning process. 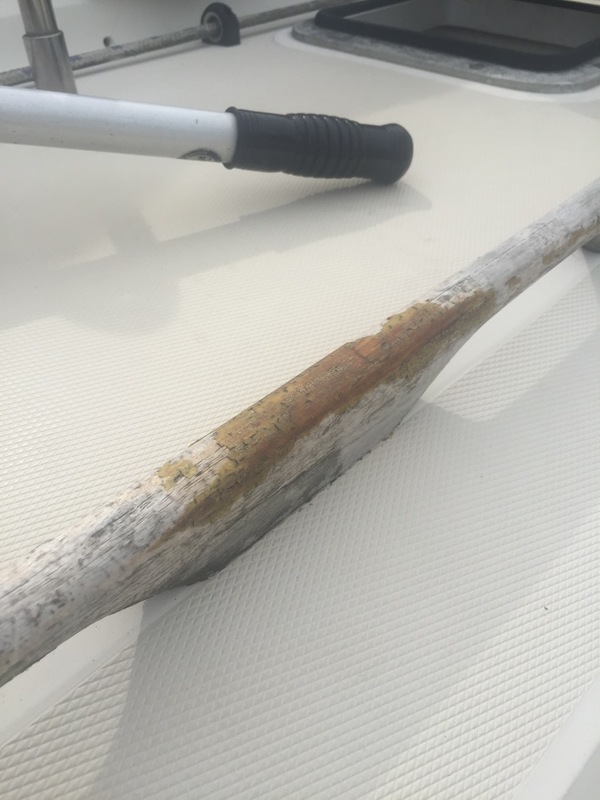 It’s recommended to not put tape down, as the sealer will want to wick under the wood, and will likely wick under the tape meaning you can’t clean up spills, and your fiberglass will be stained. The first coat might be a bit blotchy, Semco recommends 2 coats only for the first time, and it evened out really nicely on the second coat. I put 1 coat on, then immediately turned around to do the second coat. This photo shows the left rail sanded and cleaned, the right rail is after two coats of their dark brown applied to it. This is amazingly easy to work with, but like anything to do with teak, or boats for that matter, preparation is everything. 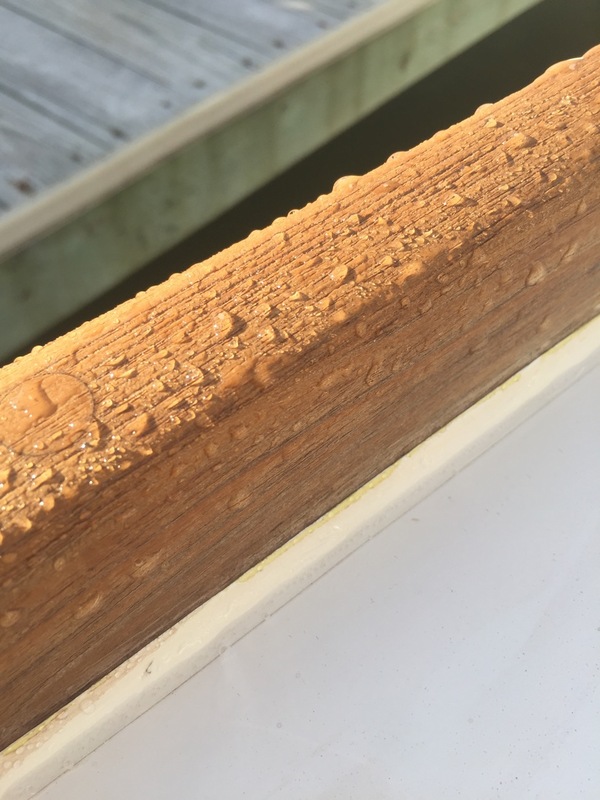 Water beads right up on the teak, which lets you know it’s still effective. They say it’ll last a year at which point you wash it with mild soap and a brush, let dry, and apply another coat. I’m probably going to apply another in a month or so, as this teak dried out an extraordinary amount. Highly recommended for its ease, we’ll see how long it lasts. 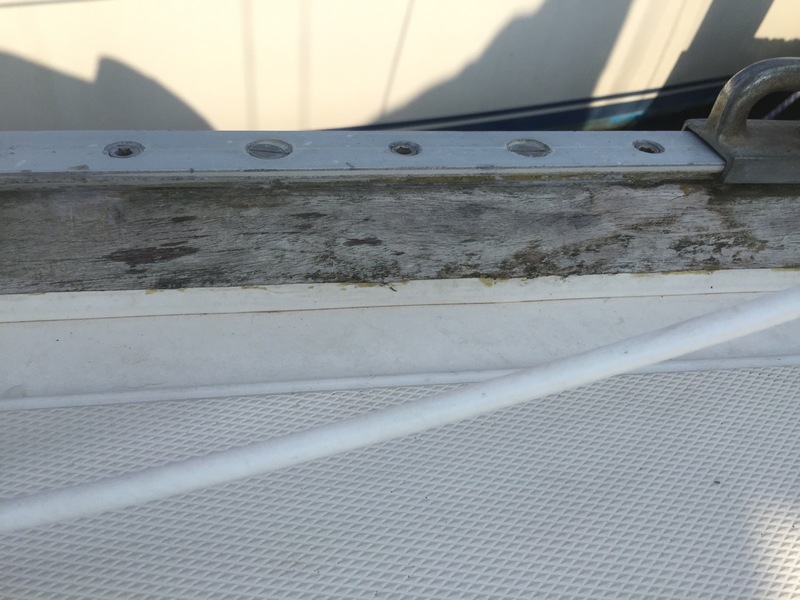 This entry was posted in Deck, Repair/refit/upgrade, Wood. Bookmark the permalink. I am enjoying your site involving your Sabre. Great start on your projects. I would love to share your great work with my group. My group is at Sabresailboat@yahoogroups.com. Thanks Mike… as I’m sure you know, it’s a labor of love, and money. I’m already a part of that great group and have shared a few things there.